I got to my store today to try on the Right As Rain Jacket, considering a swap/resale for a size 8 instead of the size 10 I currently own, and there were a few differences in the jacket but not significant fit changes. The main difference in fit is that the new version is shorter. I’m wearing the same pair of shorts in both pictures here and my Bordeaux Drama Right As Rain covers my shorts completely while they peek out the bottom of this years Plum Right As Rain. The size 10 fits me a bit large in the bust and the arms, but I like how accommodating and flared out the hips are compared to the size 8, so I think I will stick with my 10 and when I lose more weight hunt down the 8. There are some design differences to the fabric, both the new and old RAR jackets are Twill and DWR (durable water repellant). The new version is slightly softer and more flexible but the fabric is matte. The inside satin lining is also quite matte compared to my Bordeaux Drama one. I like the slicker satiny lining in mine because it makes it easier to layer items underneath. My Bordeaux Drama isn’t glossy on the outside at all but it has slightly more sheen which makes it look more saturated in color. The fleece at the chin and collar is grey in my RAR and the plum one has a plum fleece. The zipper track on the inside iphone pocket is raspberry glow inside the new Right As Rain. All in all, I think if you missed out last year and where hoping to pick one up, the new version is just as nice as last years but has some subtle changes. Fit wise, its TTS. The areas that may cause fit issues on sizing down is if you have wider hips, or if you have a larger bust or shoulders. 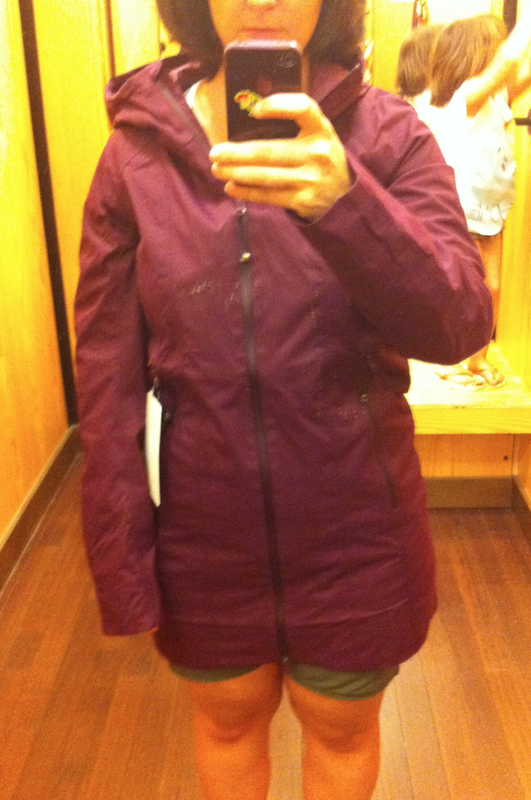 The size 10 on me allows me to layer a thick swearer underneath or my down Turn Around Jacket. The size 8 is comfortable but I probably wouldn’t be able to layer a thick scuba underneath, probably just a thinner long sleeve. It would also need to be unzipped at the bottom a bit when sitting down. The darker color and larger size are more flattering and more practical. Very nice jacket.